« Islamic Schools: Are They Preparing Children for Life Ahead? 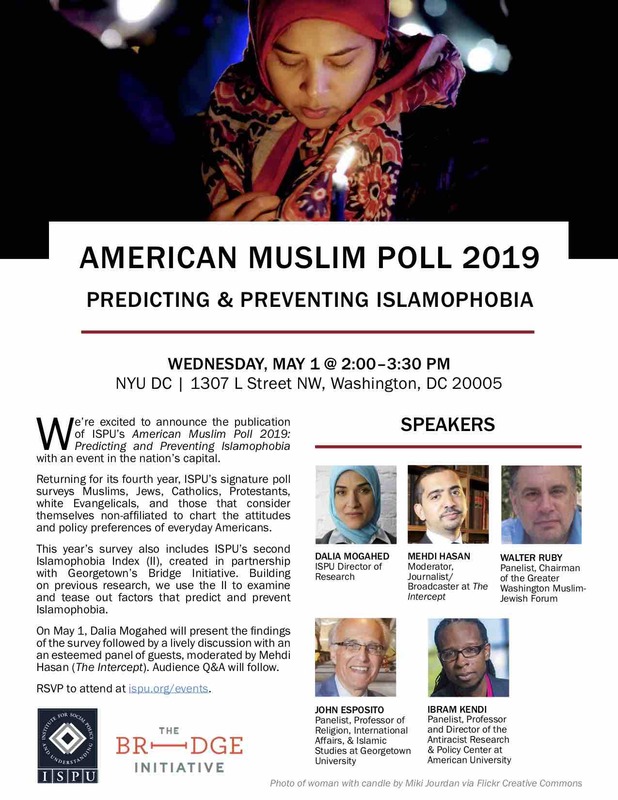 We’re excited to announce the publication of ISPU’s American Muslim Poll 2019: Predicting and Preventing Islamophobia with an event in the nation’s capital. Returning for its fourth year, ISPU’s signature poll surveys Muslims, Jews, Catholics, Protestants, white Evangelicals, and those that consider themselves non-affiliated to compare attitudes across religious groups. Triumphs and tribulations punctuated the year leading up to ISPU’s fourth annual poll. Record-breaking voter turnout at the 2018 midterm elections led to the the historic election of a diverse new class of Congress. At the same time, the Supreme Court ruled to uphold the travel ban, and the country faced the longest ever government shutdown. It was against this backdrop that ISPU’s annual poll charts the attitudes and policy preferences of everyday Americans. American Muslim Poll 2019 offers the public, policymakers, and researchers rare depth and breadth of analysis along with a set of data-driven recommendations. This year’s survey also includes ISPU’s second Islamophobia Index (II), created in partnership with Georgetown’s Bridge Initiative. Building on previous research, we use the II to examine and tease out factors that predict and prevent Islamophobia. Following the panel, there will be an opportunity for Q&A from the audience.